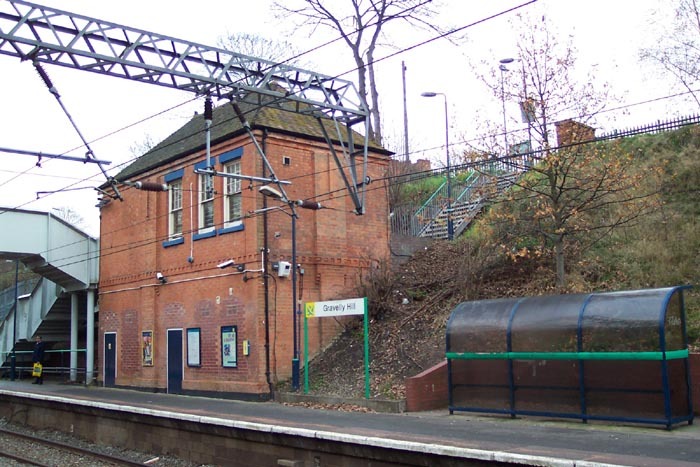 Gravelly Hill station opened in 1862 on the LNWR line from New Street to Sutton Coldfield. The station, as with many on the Cross-City line, has undergone some major changes over the years but has managed to retain at least one original feature of note. 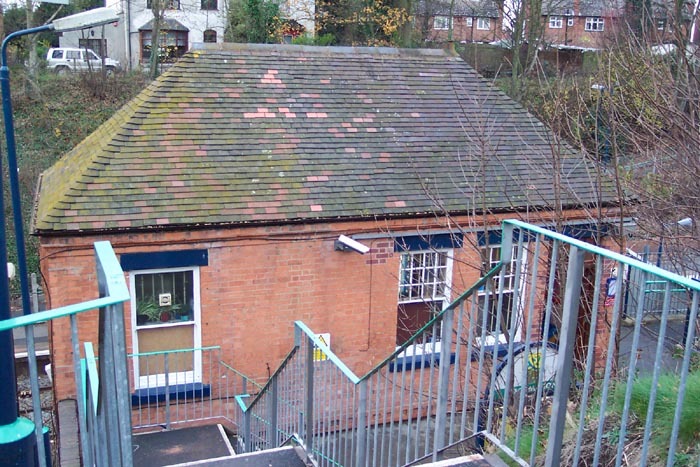 Above we see the inviting entrance to the station on Frederick Road: there are two other entrances to the station on Hunton Hill that provide access to each platform. Above-left we have walked through the entrance on Frederick Road and are looking at the booking office - the only original feature at the site. In my travels around the railway sites of the region, this building stands out as something of interest due to its two-storey nature and the fact that you enter it at the upper level. Above-right we get the perspective of the station from Hunton Hill showing the position of the booking office. This shot mirrors one shown on the 'Postcards' page. If you compare views you will notice that a dramatic change has taken place over the years. 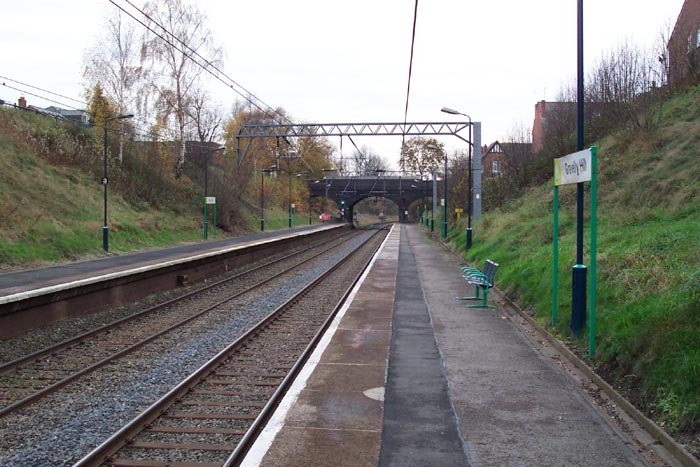 The platforms have been shifted along the track: originally they extended towards Hunton Hill, but now they are truncated just past the booking office and extend the other way towards Hillaries Road. In addition, a large waiting room was provided on the now missing section of the Birmingham platform in the area nearest the camera. 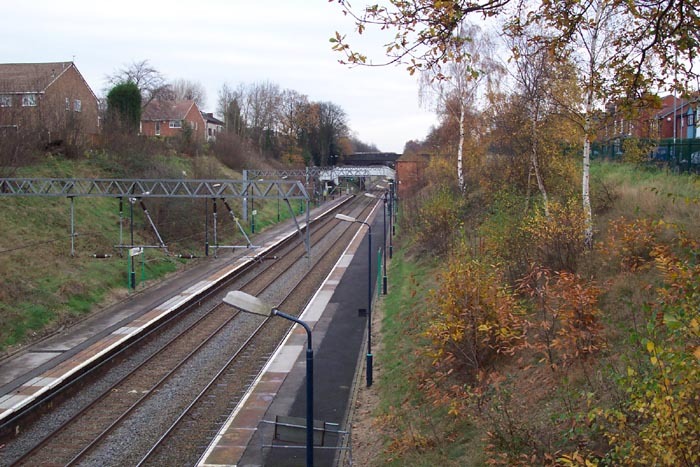 Above-left we are on Hillaries Road looking along the station in the direction of Sutton Coldfield. 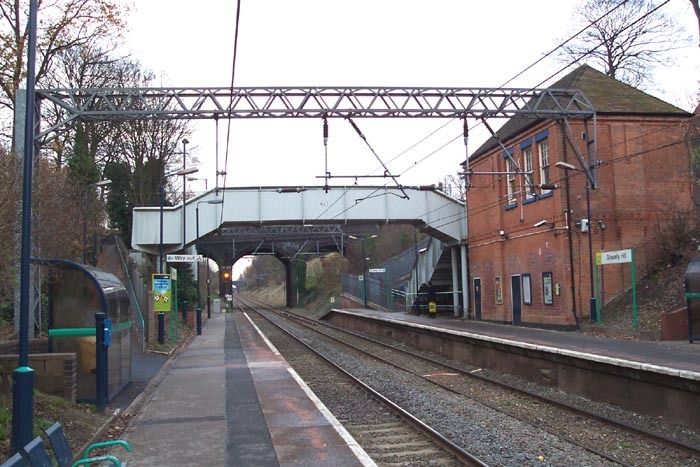 The footbridge seen here is not an original although it does give the appearance of being in situ for a considerable number of years and is of iron construction with wooden floorboards. 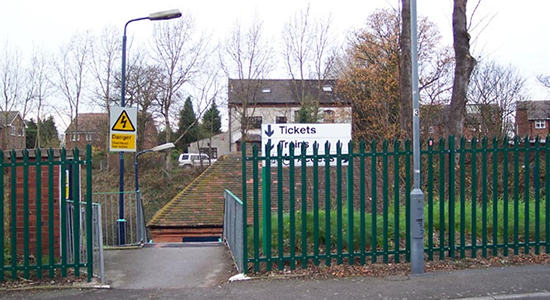 Above-right we take a closer look at the footbridge and booking office from platform level with the disabled ramp just visible beyond the booking office on the Birmingham platform part-occupying the area previously housing the waiting room. Above-left is a similar shot to the previous one but concentrating solely on the booking office. Behind the office we can see the steep stairwell leading to Frederick Road, the other end of which can be seen at the top of this page. 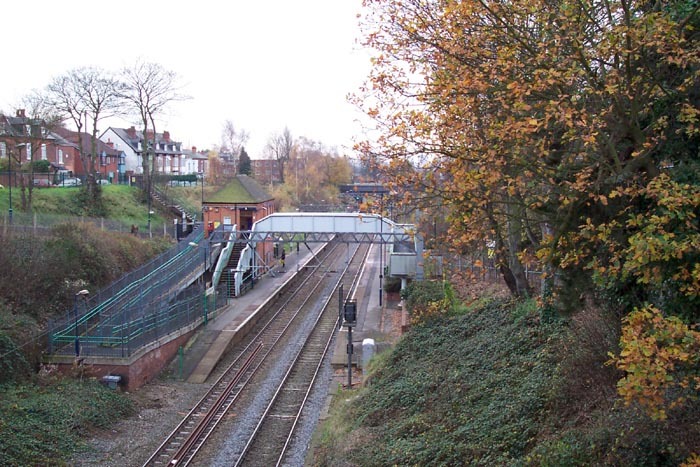 Above-right we are on the Lichfield Platform looking along the station towards Birmingham and Hillaries Road bridge. This is not one of the more inspiring sites to visit but the booking office does provide some interest.